Oscars: Declassified Documents Tell History behind Best Foreign Film Nomination, "No"
Washington D.C., October 5, 2018 – On the 30th anniversary of the historic plebiscite in Chile, the National Security Archive today posted key documents revealing General Augusto Pinochet’s secret plans to “use violence and terror” to annul the October 5, 1988, referendum and sustain his dictatorship in power. The Pinochet plot was thwarted when key officials of his own regime revealed it to U.S. intelligence agents and election monitors, and then refused to implement it in the face of overwhelming opposition by the Chilean people to a continuation of military rule. 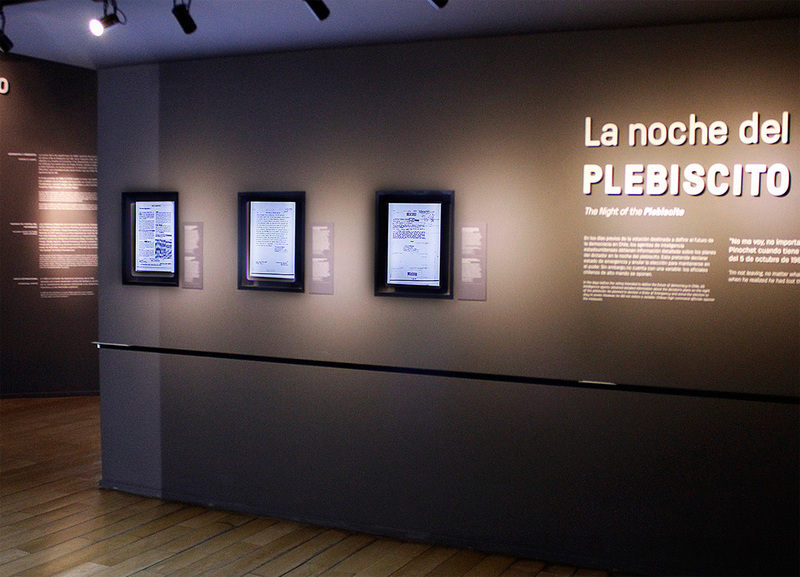 As part of Chile’s anniversary commemoration of the 1988 plebiscite, the Museum of Memory and Human Rights in Santiago incorporated these documents into its permanent, and newly renovated, exhibition on the “Restoration of Democracy.” The documents had previously been on display at the museum as part of a larger, temporary exhibit of declassified U.S. records called “Secrets of State,” curated by Peter Kornbluh who directs the National Security Archive’s Chile Documentation project. 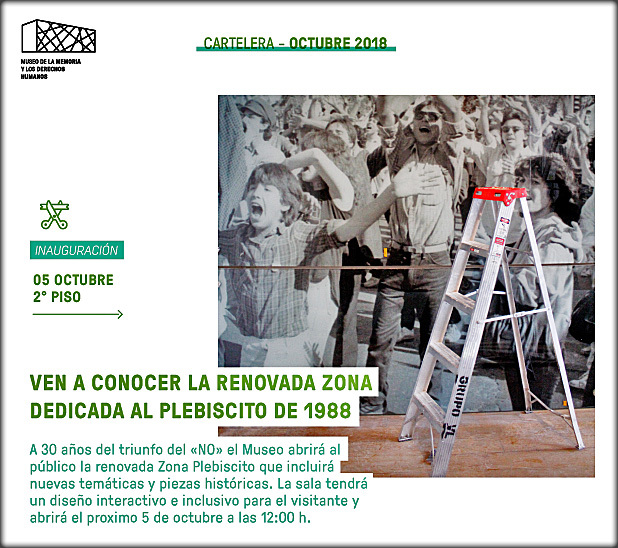 One of today’s posted documents, a Defense Intelligence Agency summary, classified TOP SECRET ZARF UMBRA, reported that "Close supporters of President Pinochet are said to have contingency plans to derail the plebiscite by encouraging and staging acts of violence. They hope that such violence will elicit further reprisals by the radical opposition and begin a cycle of rioting and disorder. The plans call for government security forces to intervene forcefully and, citing damage to the electoral process and balloting facilities, to declare a state of emergency. At that point, the elections would be suspended, declared invalid, and postponed indefinitely." Indirectly, a top military officer, Brig. Gen. Jorge Zincke, also passed information on the plot to officials of an election monitoring group, Civic Education Crusade, who immediately reported it to the U.S. Embassy. In an alert to Washington Ambassador Harry Barnes reported that he had received information regarding “an imminent possibility of government staged coup” and predicted “substantial loss of life” if Pinochet’s plot to overturn the vote was implemented. The declassified record shows that Reagan administration officials, who had come to view Pinochet as an undesirable dictator because his intransigence was radicalizing the militant left and marginalizing the political center in Chile, acted quickly on this intelligence. President Ronald Reagan was briefed on the situation. U.S. officials sent unequivocal demarches to a broad range of regime officials – in the foreign and interior ministries, the army, the Junta, and to Pinochet himself. Between 1970 and 1973, U.S. officials had secretly encouraged the Chilean military to foment a coup against the elected government of Salvador Allende. 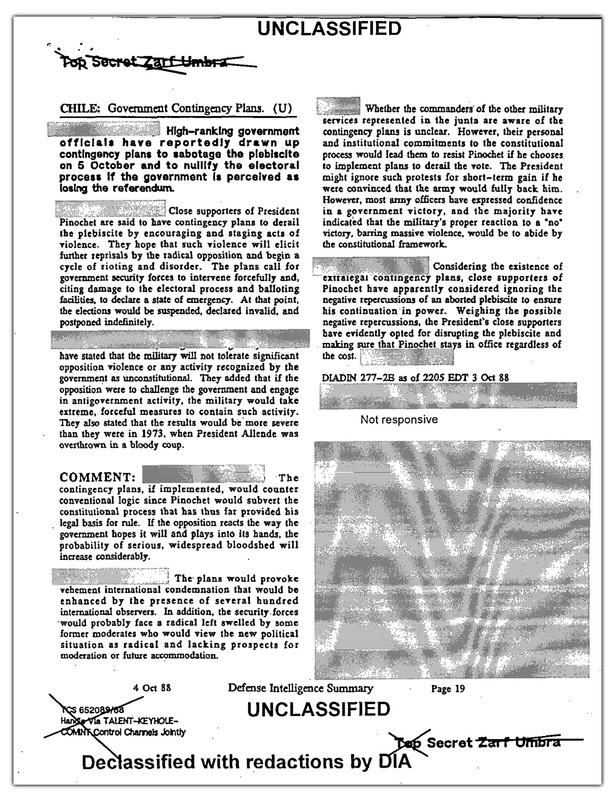 Now, the CIA Station Chief received instructions to strongly advise Chilean secret police officials against such action and U.S. officers at SOUTHCOM issued similar warnings to their contacts inside the Chilean military "not to take or permit steps meant to provide pretext for canceling, suspending or otherwise nullifying the plebiscite." Nevertheless, Pinochet attempted to implement his auto-coup plot. His effort to orchestrate chaos and violence in the streets failed, however, when the Carabinero police refused an order to lift the cordon against street demonstrations in the capital, according to the CIA informant. In a dramatic last gasp to hold onto power, Pinochet called the members of the military Junta to his office at the Moneda palace at 1:00 AM. He was "nearly apoplectic" about the turn of events, one participant of the meeting noted. "The Chilean President and CINC of the Army Gen. Augusto Pinochet was prepared on the night of 5 Oct to overthrow the results of the plebiscite," an informant reported. Pinochet was insistent that the Junta give him extraordinary powers to meet the crisis of the electoral defeat. "He had a document prepared for their signatures authorizing this .... Pinochet spoke of using the extraordinary powers to have the armed forces seize the capital. At this point Air Force commander Fernando Matthei stood up to be counted. Matthei 'told Pinochet he would under no circumstances agree to such a thing ... he had had his chance as the official candidate and lost.' Pinochet then turned to the others and made the same request and was turned down ...."
Without the Junta's support to overthrow the results of the plebiscite, Pinochet was left with no alternative but to accept defeat at the hands of Chile's democratic forces. Some 98 percent of eligible Chileans cast their votes 30 years ago today. Final results had the “NO” winning by more than 800,000 votes – a 54.7 percent to 43 percent victory to end, peacefully and democratically, the Pinochet dictatorship. 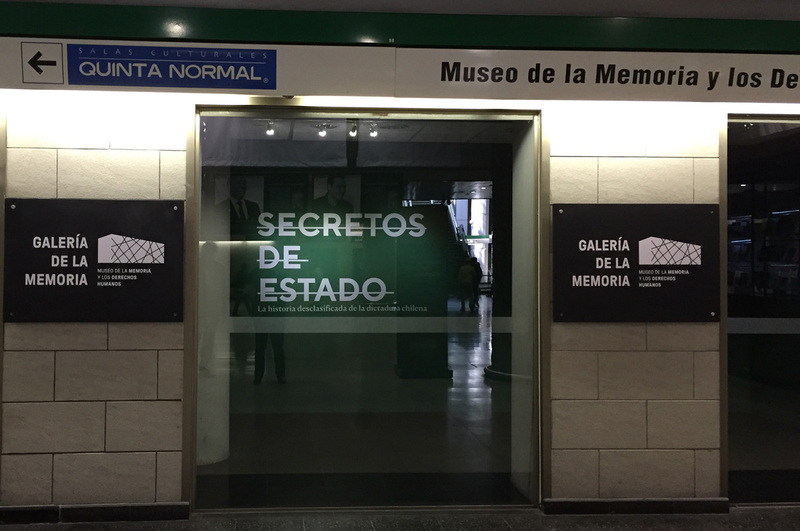 In a ceremony marking the 30th anniversary today, the Museum of Memory and Human Rights in Santiago inaugurated its new permanent exhibition on the extraordinary history of the efforts of Chileans to end Pinochet’s rule and restore democracy. The four documents below are now permanently on display in the museum. 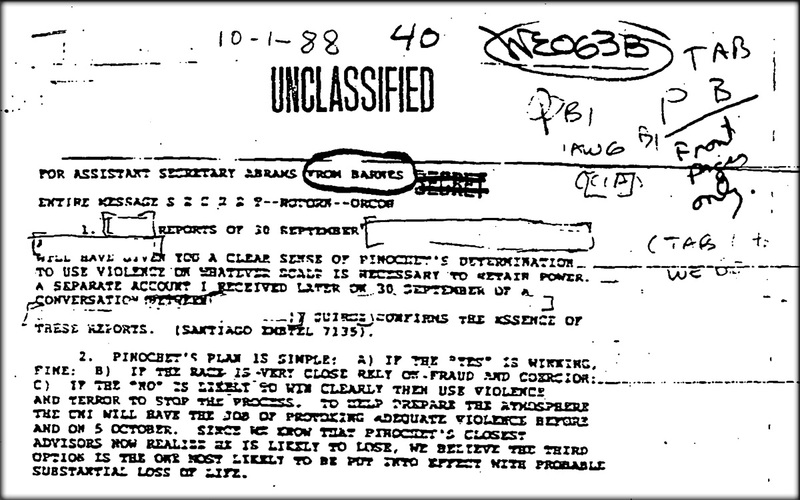 Top Secret Defense Intelligence Agency Report on Pinochet's plan to foment violence and annul the results of the plebiscite.